For those who like to keep track of such things, here is a list of European royal events (Marriages, funerals) with the British representation. The final decision on who is sent depends on several factors, including whether the event is a state occasion or a nation event. The final decision is made on the advisement of the Foreign office. It is not always the Sovereign's decision. 1935 Crown Prince Frederik Wedding: Prince and Princess Arthur of Connaught and Lady Patricia Ramsay. Prince Arthur was the official representative. He was the bride's uncle. 1995 Prince Joachim wedding: Prince Edward. 2010 Queen Margrethe II's 70th birthday: Prince Philip, Duke of Edinburgh (who had to cancel due to the volcanic ash from Iceland. 1964 Marriage of King Constantine. Duke of Edinburgh. 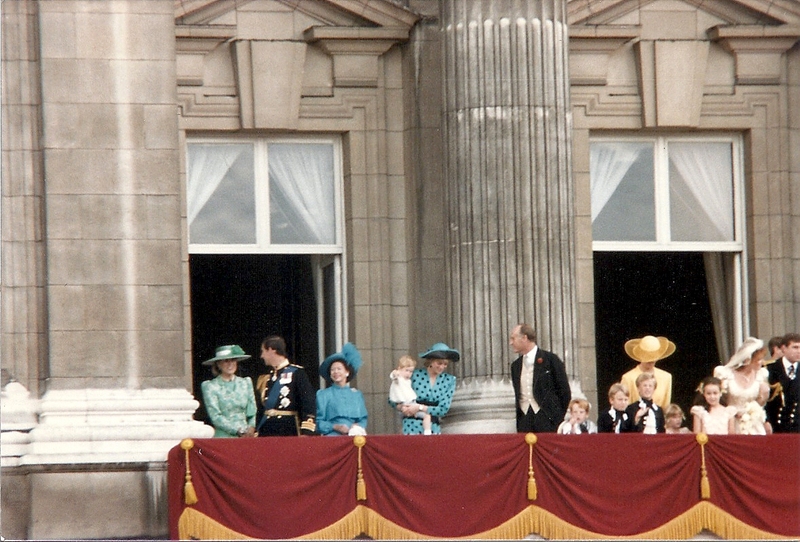 The Prince of Wales and Prince Michael of Kent were two of the crown bearers. Princess Marina, Duchess of Kent also attended, as did Princess Anne. 2011 Prince Albert wedding: the Earl and Countess of Wessex. Prince and Princess Michael of Kent also attended but did not represent the Queen. 1934 Queen Emma funeral: no official representation, although Lady May Abel Smith attended. 1948: Queen Juliana's installation: Princess Margaret, accompanied by the Earl of Athlone and Princess Alice, Countess of Athlone. 1962 Queen Juliana and Prince Bernard's Silver wedding: Queen Elizabeth II and Duke of Edinburgh (visit was described as semi-private). Princess Marina, Duchess of Kent and Princess Alexandra of Kent also attended. 2013 King Willem-Alexander's installation: the Prince of Wales, accompanied by the Duchess of Cornwall. 1927 King Ferdinand: None although the Duke of York represented the King at the Memorial Service at the Greek Cathedral of St. Sophia in London, which was held on the same day as the funeral. 1973 King Gustaf VI Adolf funeral: The Duke of Edinburgh. He was joined by Lord Mountbatten and the Princess of Hesse. Lord Windlesham represented Princess Alice, Countess of Athlone. 1976 King Carl XVI Gustaf wedding: The Duke and Duchess of Gloucester. kind of sad that the monarchs in Denmark, Sweden AND Norway all attended Queen Fabiola's funeral, yet NOBODY from the British royal family bothered! it's not like it was (in an alternate world) a Belgian former First Lady or something - this is someone who, before her title comes into play, is family. granted, only by marriage, but she was married to their cousin. kind of sad that the monarchs of three foreign nations made the time, and other countries sent other royals as representatives, yet not so much as Prince Edward or one of the Dukes (even the Queen's cousins would've done!) were sent. do you know if this is something that the Queen would typically say "nobody is going to x event" or if others could choose to go as family members rather than in an official capacity if the Queen doesn't send someone on behalf of Britain? When you say that it's not the sovereign's decision, but made on the advice of the foreign office…do you mean the decision to send a royal representative, or does the foreign office determine which member of the family would be best suited? If the former, is the specific of who left to the sovereign? The invitation is not sent sovereign to sovereign, but through diplomatic channels - one assumes there is contact between sovereign and her government, and their advice on the matter. The Sovereign cannot overrule a decision, that could cause a constitutional crisis. I am sure the queen was upset by this decision, but she could not change it. Thanks for the response, Marlene, that's very helpful. Follow up question: is it possible for members of the British royal family to attend in a private capacity? For instance, Prince and Princess Michael didn't attend some Monaco functions officially, but privately. Would that have been possible in this case, or would that be going against ministerial advice? It would have been unlikely for a British royal to attend the funeral if they were not official. I think this was a mistake by whomever authorized the non-attendance of a member of the British royal family.It was a matter of respect to the memory the late queen, to her family,and to the Belgian people. It was a political and more importantly a social blunder.The foreign office or the committee made a very unwise decision,making the British look uncaring and crass. The fact that these things go through diplomatic channels first was show perfectly when Spain's Queen Sofia did not attend Queen Elizabeth II's Diamond Jubilee Sovereign's Lunch. She had accepted the invitation but was then ordered to turn it down by the Foreign Ministry as retaliation for a planned visit by the Earl & Countess of Wessex to Gibraltar.